$1000 Walmart Gift Card Winner ads can appear on Windows, MacOS, iOS and other operating systems. Soon after being infected with the virus, the corrupted Walmart 1000 gift card popup ads begin to emerge. These notifications will feature all the recognizable features and signs of the company, such as the same color palette and logo. Thus, they might be difficult to distinguish from the legitimate ones. In reality, scammers use famous brand names like Walmart, ebay, Amazon and others to get the unsuspecting users involved in their shady businesses. $1000 Walmart gift card scam informs people about supposed lottery winnings, and encourages them to play obscure online games or complete surveys in order to “win” the prize. This is typical behavior of adware which is designed to display these pop-ups regardless of whether the user desires to see them. Examples which are almost identical include National consumer center, Congratulations you won virus, Amazon gift card scam and many others. All of this intrusive advertising is focused on promoting specific products, stealing personal information or even installing malware on the victim’s computer. If similar ads and pop-ups start appearing on your browser, this suggests that it is time for a system checkup. If you are not sure where to turn first, we recommend trusting $1000 Walmart Gift Card Winner removal to a reliable antivirus utility, such as Reimage. If you are looking for a way to get rid of it from an iPhone, iPad or similar mobile device, reset it to its factory settings and forget about disturbing behavior while using these devices. 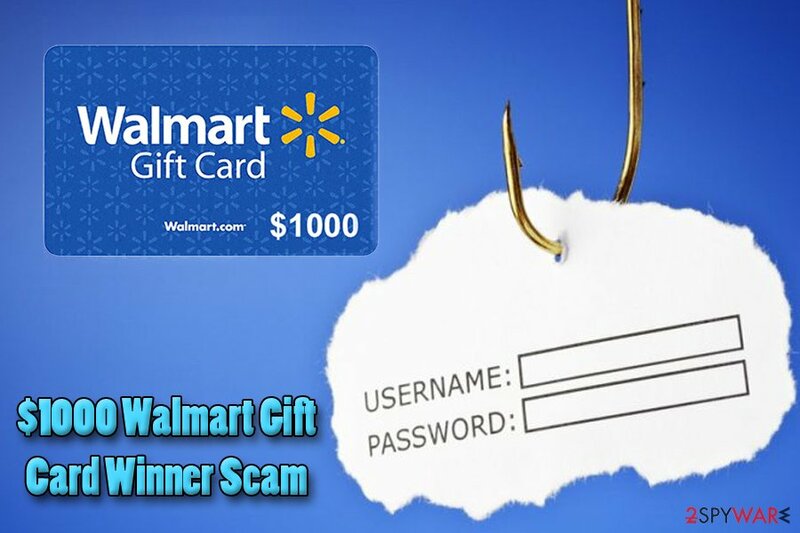 Walmart Gift Card Winner - a scam designed by scammers to swindle money from credulous people. Nevertheless, all this trickery comes to light when the user clicks on Walmart Gift Card Winner ad and is immediately redirected to some infectious domain. Some less informed users may continue to install the offered applications or obtain suggested services even though such behavior can quickly lead to security breaches, privacy violations or even financial loss. That is why you should remove $1000 Walmart Gift Card Winner virus without second-thinking as soon as you find its ads popping up on your browser. Remember that nothing comes free and such almost-too-good-to-be-true offers are most likely a scam. For those who have never encountered adware before and are not aware of how to get rid of Walmart gift card virus, we suggest using the elimination guide below. There are brief step-by-step guidelines which will be easy to use even if you do not have specific IT knowledge. 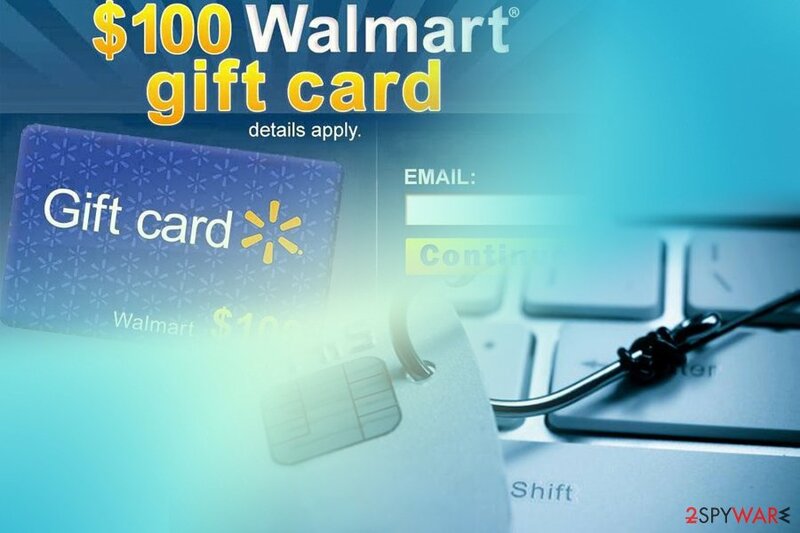 While most commonly users receive such scam offers during browsing sessions on their computer, we have received several reports that Walmart 1000 gift card popup on iPhone or iPad is also bothering smartphone users. They warn that their phones' performance has significantly decreased once annoying scam messages started to occur. Furthermore, other operating systems on mobile phones are vulnerable to ad-supported programs as well — Walmart gift card virus on Android is also present. Unfortunately, but this is the consequence of your irresponsible behavior when downloading third-party applications. Walmart Gift Card Winner virus owners are often trying to extort important personal information or even credit card details. Smartphone viruses infiltrate the systems while imitating innocent applications. Usually, they are offered on unauthorized app stores as Flashlights or other programs. Note that in order to compromise your device they need to gain administrative rights and you are the one who gives them. Therefore, do not download or install suspicious applications from third-party app stores. Always read the reviews online and make sure that they are developed by verified authors. Also, you should be aware that such apps as an Alarm Clock do not need Admin rights and this is the first alert that the program might be malicious. While the distribution of facebook.com-walmart.com virus is completely legitimate, we find it highly unfair from the standpoint of the computer users. Developers of such programs bundle them together with free software and do not inform about it during the installation/download procedure. Labelled as a Recommended or Quick install, this adware simply installs simultaneously with some audio or video player you have downloaded on your device. However, this could have been stopped if only you have chosen the Advanced installation mode in the software’s setup. Users can get lured by an attractive ads. Nevertheless, they will get nothing in return, as it is merely a scam. While there are several ways to remove Walmart Gift Card Winner ads, note that some of them are easier than the others. Both manual and automatic elimination are possible. However, the latter one requires you only to download an antivirus tool and run an entire system scan. For that, you can use one of the security programs listed below, because we are sure that they will do all the job for you. After $1000 Walmart Gift Card Winner removal, you will be able to enjoy full system protection in the future. Therefore, do not hesitate and invest in your security. Experts from BedyNet.ru note that manual elimination is a more complicated process. Thus, we suggest you using the instructions below which will explain how to do it step-by-step. However, it is vital to follow them attentively not to damage your system. If you are wondering, how to get rid of Walmart Gift Card virus on iPhone, check what suspicious apps have you recently installed. Of course, you must remove all of them and then reinstall your web browser app. If the problem reappears, perform the factory reset. For that, use this guide: How to remove iPhone virus. To stop Walmart pop up ads on Windows, uninstall all suspicious programs that could be related to advertisers. Here, look for “$1000 Walmart Gift Card Winner” or any other recently installed suspicious programs. To get rid of Walmart gift card virus on MacOS, identify and delete all components that seem suspicious. Wait until you see Applications folder and look for “$1000 Walmart Gift Card Winner” or any other suspicious programs on it. Now right click on every of such entries and select Move to Trash. When in the new window, check Delete personal settings and select Reset again to complete “$1000 Walmart Gift Card Winner” removal. Once these steps are finished, “$1000 Walmart Gift Card Winner” should be removed from your Microsoft Edge browser. Here, select “$1000 Walmart Gift Card Winner” and other questionable plugins. Click Remove to delete these entries. Now you will see Reset Firefox to its default state message with Reset Firefox button. Click this button for several times and complete “$1000 Walmart Gift Card Winner” removal. To fix Chrome, delete all unknown entries and resetting your browser. Here, select “$1000 Walmart Gift Card Winner” and other malicious plugins and select trash icon to delete these entries. Click Reset to confirm this action and complete “$1000 Walmart Gift Card Winner” removal. Here, select Extensions and look for “$1000 Walmart Gift Card Winner” or other suspicious entries. Click on the Uninstall button to get rid each of them. Now you will see a detailed dialog window filled with reset options. All of those options are usually checked, but you can specify which of them you want to reset. 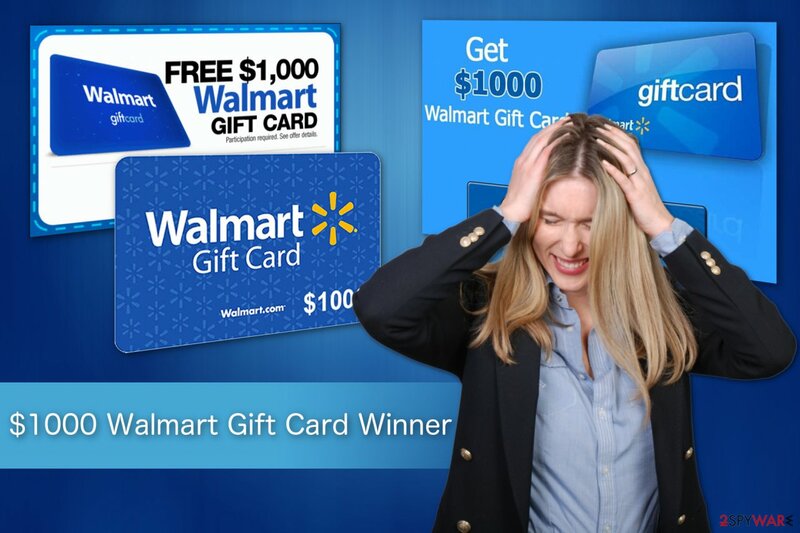 Click the Reset button to complete “$1000 Walmart Gift Card Winner” removal process. 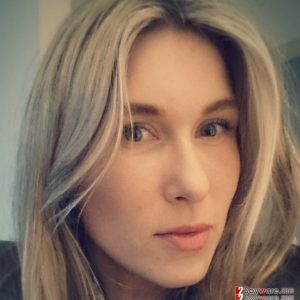 ^ Fraud Alerts that are not from Walmart. The official Walmart page. ^ What is Adware?. Kaspersky Lab. Kaspersky Antivirus Protection & Internet Security. ^ Kannon Yamada. The Seven Deadly Android Permissions: How to Avoid the Sin of Slothful Preparedness. MakeUseOf. Technology, Simplified. 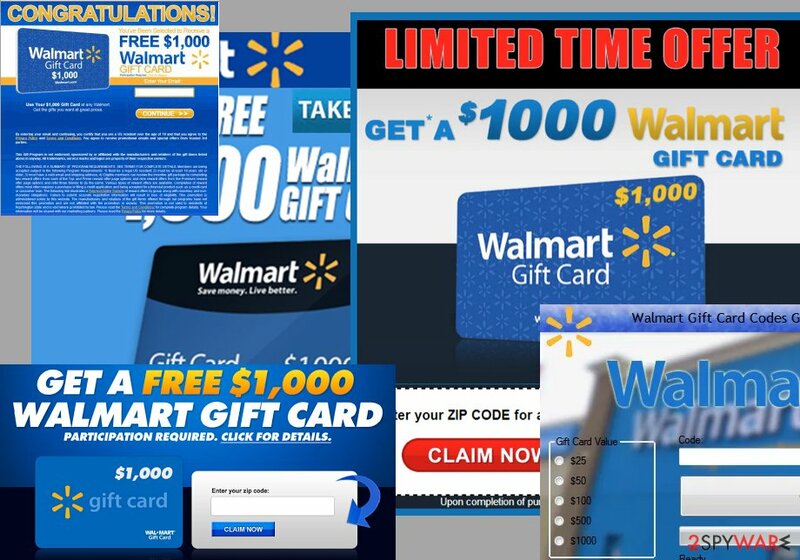 Jak usunąć "$1000 Walmart Gift Card Winner"
This entry was posted on 2019-04-01 at 01:59 and is filed under Adware, Viruses. You can quickly scan the QR code with your mobile device and have “$1000 Walmart Gift Card Winner” ads manual removal instructions right in your pocket. How did you remove “$1000 Walmart Gift Card Winner” ads?